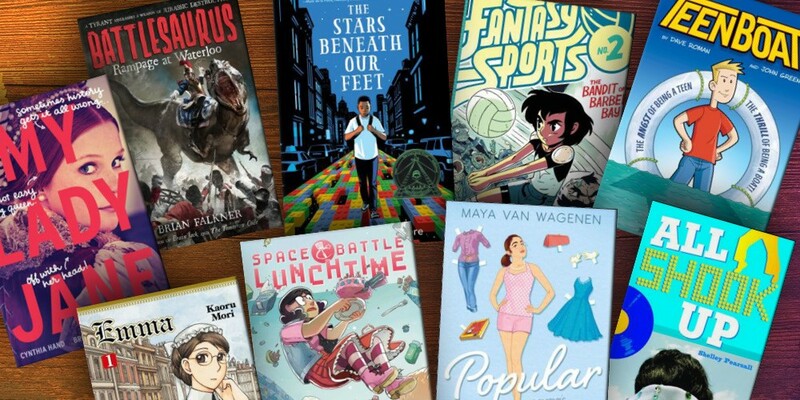 News & Events - Unique, Unusual, and Unexpected Finds – Teen Books to read this January! Fantasy Sports by Sam Bosma - You may have played fantasy football online, but I guarantee that you have never played fantasy sports like this! Main characters Mug and Wiz must accomplish their quests in a fantasy world by completing outrageous sports challenges. Give this series a try if you are looking for something different! Space Battle Lunchtime by Natalie Riess - An intergalactic TV cooking competition that takes place on a spaceship is the name of the game in this original graphic novel series. If moon butter, swamp pod pie, and star-topped cupcakes sound yummy to you, be sure to check out this light and fun story. The colorful artwork is an added bonus. Teen Boat! by Dave Roman – Flying, super strength, x-ray vision… the ability to transform into a yacht. When the teenage protagonist of this graphic novel discovers he has superpowers, guess which one of the above applies to him. The subtitle of this graphic novel is “The Angst of Being a Teen! The Thrill of Being a Boat!” Definitely not your usual superhero story. Emma by Kaoru Mori – Many of the manga volumes at our libraries are about ninjas fighting treacherous enemies, pirates sailing the seven seas, or high schoolers finding their true loves. Instead of these topics, Emma tells a romantic story set in Victorian England and features a simple maid and the eldest son of a wealthy English merchant family. If you are looking for a manga series that is more Downton Abbey than danger and action, Emma is a great pick! Popular by Maya Van Wagenen – Maya Van Wagenen, a real-life Texas middle school student, decides to put an experiment to the test: Will following the rules in a 1950’s social and etiquette guide for girls help her to become popular? Maya makes careful observations about her trials and the results. This book’s unusual premise leads to an engaging chronicle of one student’s journey as she finds out more about her friends, her peers, and her family. The Stars Beneath Our Feet by David Barclay Moore – I’m a big fan of Legos, so the Lego artwork on the cover of this pick caught my eye. The Stars Beneath Our Feet is one of the best-reviewed teen books of 2017. It tells a powerful story of a boy growing up in Harlem who must find his place in the world after his family experiences a great loss. Check out this realistic fiction novel today, and you will discover how a connection with Legos evolves into a great source of strength. My Lady Jane by Cynthia Hand, Brodi Ashton, and Jodi Meadows – Lady Jane Grey did not have the best life in all of English history. My Lady Jane gives her a better story – one full of fantasy adventure and lots of humor. This book features a boy who turns into a horse at sunrise, a girl who turns into a ferret, and one of the most charming love stories in YA fiction. If any of that sounds intriguing, you owe it to yourself to take a look at My Lady Jane! Battlesaurus: Rampage at Waterloo by Brian Falkner – Ever wonder what would have happened if rampaging dinosaurs had been part of Napoleon’s military campaigns in Europe? Neither have I, but it definitely is a unique idea! If you are a history buff, a dinosaur enthusiast, or a reader looking for an offbeat action-packed tale, give Battlesaurus a try! All Shook Up by Shelley Pearsall – When Josh moves in with his dad, he is horrified to learn that his dad is an Elvis impersonator. Josh knows this will threaten his popularity at school, and when circumstances arise that would bring his dad to school in full costume, All Shook Up shakes into high gear. This funny realistic fiction book is from the author of The Seventh Most Important Thing. If you are interested in any of these topics, put them on hold today using our online catalog. Happy browsing, and discover a new series or story for yourself during a trip to your local Henrico County Public Library location!